GOMA, DR Congo , Jul 25 2013 (IPS) - At a popular tourist art market in Goma, in eastern Democratic Republic of Congo, paintings and art sculptures made from bronze, copper, malachite, stone or wood attract visitors. It seems like an ordinary tourist market. But only the regulars know that this is also a black market for ivory products. “Even though it’s illegal, the ivory market still attracts art lovers, especially foreigners who hire brokers,” a craftsman who requested anonymity told IPS. Although an almost blanket ban on trading in ivory has been in place since 1989, the black market trade in ivory from forest-dwelling Congo Basin elephants is alive and well in the DRC’s large urban centres. As far back as 2010, the Convention on International Trade in Endangered Species of Wild Fauna and Flora accused the Congolese army of being “responsible for 75 percent of poaching in nine out of 11 sites” in the country. The World Wildlife Fund (WWF) has declared the forest-dwelling Congo Basin elephants an endangered species. The Congolese Nature Conservation Institute, known by its French acronym ICCN, estimates that around 1,000 elephants were poached in DRC between 2010 and 2013. The organisation also believes that local chiefs have been complicit in elephant poaching. 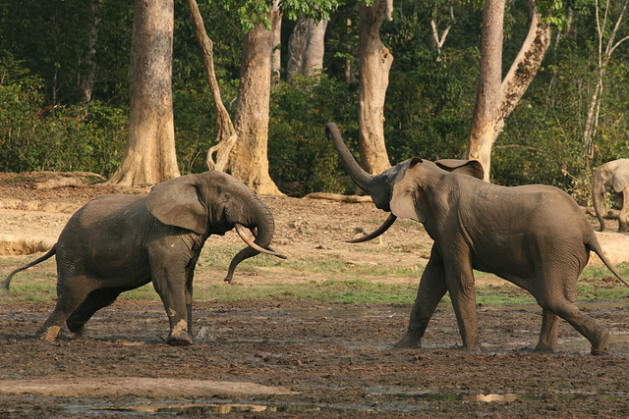 According to ICCN, 70 percent of the Congo Basin’s forests, home to the forest-dwelling elephant, are in the DRC. A WWF study published last May stated that there are currently only 7,000 elephants in the country, compared to the 100,000 that existed 20 years ago. “The demand for ivory sculptures and curios in Asian markets is driving elephant poaching,” Emmanuel de Mérode, ICCN director in North-Kivu, told IPS. He added that a kilogramme of ivory sells for 1,500 euros on the black market. He said that poaching has become “an organised crime network which is virtually using arms of war.” De Mérode was referring to a poaching incident in the Garamba National Park in the country’s north-east in March 2012. In that case a combat helicopter, manned by suspected Ugandan soldiers, was used to shoot dead 22 elephants. The DRC has nine national parks and about 60 reserves and hunting grounds managed by the ICCN. Altogether this represents 10.47 percent of the DRC’s territory, about 250,000 square kilometres, and includes five protected areas on the United Nations Educational, Scientific and Cultural Organisation World Heritage List. But the ICCN is powerless to secure these areas against heavily-armed poachers who regularly cross the DRC’s eastern frontier equipped with technology such as Global Positioning Systems and satellite phones. Congolese law also hinders the attempts to save the country’s elephants as it allows for foreigners caught poaching to be deported. “Deportation undermines the fight against poaching. Legislation should be applied scrupulously to protect the animals and arrest foreigners,” Bonyoma said. Environmentalist Justin Mufuko told IPS that forest elephants play a vital role in preserving biodiversity. They distribute grains, roots and fruits from tropical trees through their dung, which is also compost for new plants. He believes that the incentive scheme put in place by the ICCN in 2010 to protect DRC parks is the only solution to combat elephant poaching. The ICCN has been encouraging villagers to expose poachers and in turn provides financial grants to community-based organisations with viable projects. “By financing small-scale agriculture and livestock community projects, the ICCN is discouraging villagers from becoming accomplices to poachers and getting involved in illegal activities,” Mufuko said. The total amount provided in grants depends on the overall project cost, but most projects are relatively small. Mufuko added that this awareness campaign has helped slow down the rampant rate of elephant shootings in the DRC. WWF has warned that if nothing is done to stop this process of extinction, there will be no elephants left in Central Africa within the next few years.